In our interview with psychiatrist, researcher, and entrepreneur, Michael Freeman, he mentioned that his research paper on mental health and entrepreneurs borrowed its title from Touched with Fire, a prize-winning book by the renowned clinical psychologist Kay Redfield Jamison. Her book has been called a “remarkable achievement” by people who hopefully know what they’re talking about. Well, we thought we better take a look at that book. 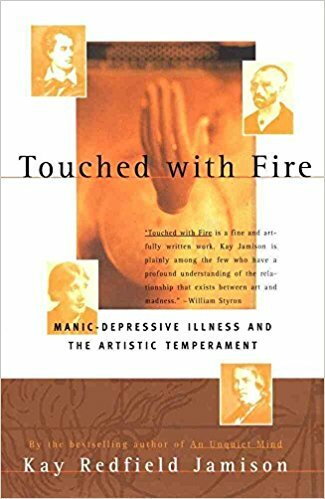 The full title is Touched with Fire: Manic Depressive Illness and the Artistic Temperament. And yes, she focuses on that mental health issue and artists. But you could argue that entrepreneurs are very much like artists: they create. And there are definitely passages in the book where you could substitute “entrepreneur” for “artist.” Also, while many of us – most of us, in fact – don’t suffer from manic depression in a clinical way, there are many insights into our personalities offered by Jamison that make her book well worth the read! That’s existential in our humble opinion. It also reminds of us of entrepreneurs we’ve talked to: they’d prefer a life of risk and unknowns, of highs and lows, of sacrifice and struggle – all of which gives meaning to their lives. Does Her Research Sound Familiar? What should be added to this final thought is that many entrepreneurs are driven to make the world a better place, to find solutions to human woes. And in this desire, they make more than their fair share of sacrifices, often with little reward. There’s lots of great stuff in Jamison’s book, as mentioned up top. It inspires, comforts, and enriches as we learn about ourselves through a different but similar lens. Recognizing time is short, take a look if you have the time.